Focus Multimedia has recently released the latest version of the popular Redshift planetarium software and they kindly provided me with a copy to review. The software is in fact more than just a desktop planetarium but also a highly detailed star atlas, planetary atlas, solar system simulator and reference tool. Indeed, there is so much to this product that it is impossible to do it justice here. Installation was trouble free and took about 5 minutes. You will need QuickTime 6.3 but this bundles with the software and can be installed at the same time. You are given a choice of compact, 'recommended' or full installation. Full installation places everything including the exhaustive star catalogues and object databases on your hard drive. Even so to run the program without the CD in the drive requires you to enter an activation code found inside the case and go briefly online. A guided tour runs by default whenever the program is started but can be turned off if you require. Once the program is running you are presented with a view of the night sky as seen from the Earth's surface. The current time and date is taken from your computer's clock, and the location is initially set to somewhere like London or New York. I immediately proceeded to enter my actual location in the program and easily found my way to a global list of towns and cities. Sadly, my location (Derby, UK) was not on the list, although most of the major cities in the UK were. So I chose Birmingham which is sufficiently near to me for most practical purposes. If desired one’s exact latitude and longitude may be stored, however. This sky view is the essential planetarium part of the software. The date, time, zoom, and view direction can all be changed through pop up control menus. The program initially loads with a ‘sample workspace’, but as I later discovered one needs to load a ‘new workspace’ in order to make available all the pop up menu options and controls. As you zoom in, the number of visible stars and their limiting magnitude is increased, mimicking the effect of viewing the sky through optical aid at progressively higher magnifications. The number of stars that are displayed can also be selected based on magnitude, spectral type or even distance to name but a few choices. Similar controls are available for deep sky objects. In this way a detailed star map of whatever section of the sky the user chooses may be plotted. In fact some 20 million stars are available, including the Hubble Guide Star, Hipparcos and Tycho catalogues. Many options are available for controlling the number and types of stars and other objects plotted, as well as their labelling. Some 70,000 deep sky objects are available, including the Messier, NGC, IC and Caldwell Catalogues, among others. Actual images of many of the deep sky objects are included and when zooming in these images appear as if one was actually observing that part of the sky through a telescope or binoculars. A note of caution though – the uninitiated may gain the impression that many of these deep sky objects will appear in the same photographic glory when actually seen through the telescope, instead of the fuzzy blobs they actually do! The outlines, boundaries, and names of the constellations may also be plotted. Even line drawings of the mythological figures, creatures and objects that they represent can be shown. 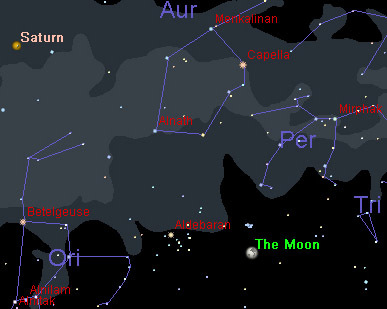 For constellation labels one can choose from the Latin name (e.g. Ursa Major), the abbreviated Latin name (e.g. UMa) or the English name (e.g. Great Bear). On the downside I found the large size of the constellation labels to be irritating as they drown out the stars and clutter up the screen. This is particularly so at lower zoom settings when one chooses to label all the constellations and the full names are used. Fortunately the sizes of the star and object labels was quite acceptable, with most of the labels only appearing when the user places the mouse pointer over the star or other object. Naturally all the planetary positions are plotted, as well as their moons, together with data for 50,000 asteroids and 1,500 comets. For the asteroids and comets the number that are actually plotted is highly configurable in order not to clutter your virtual view! The software even contains data for a large number of Earth orbiting satellites as well as interplanetary probes. These object databases may be augmented by data from the internet, although you will need to have registered that activation code. I decided to plot a current position for Comet Encke 2P/2003. I went to the Objects tab of the Filters pop-up and selected Comets, using the Edit facility to add Encke to the list of displayed favourites. Choosing the real image display setting unrealistically produced a great comet tail across the screen so I chose show just an icon instead! I also decided to update Encke’s orbital elements with the latest data from the internet. I did this by selecting Encke 2P/2003 from the list of objects in the Add/Edit object menu and using the Import facility. This provided me with a choice of three internet sites for downloading the latest data. I selected one and the database was duly updated. 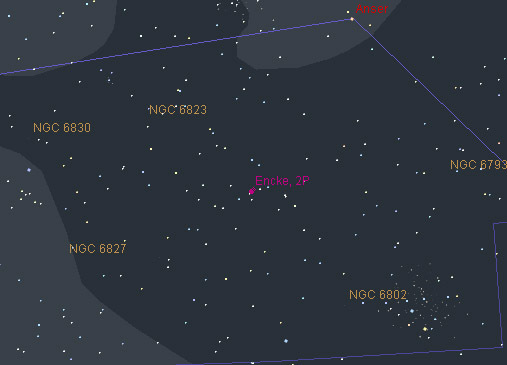 The position of Comet Encke in Vulpecula on 21st November 2003. The Coathanger cluster is visible at lower right. A particularly handy feature was the sky diary which lists eclipses, conjunctions and other astronomical phenomena. One can also get a list of rise and set times, for the Sun, Moon and planets, apparent magnitudes and angular size etc. While reviewing the software I discovered an apparent error in the rise/set times produced by this tool which became especially obvious when one asked for the current times of sunrise and sunset (e.g. sunrise at 10:00 am GMT in one example!). I contacted technical support at Focus Multimedia who in turn got me in touch with the Redshift Project Manager from Maris Technologies in Russia who developed the software. It turned out that the default time zone setting in the sample workspace was set to GMT+3h (i.e. Moscow time)! I was kindly provided with a replacement sample workspace with the time zone set for Britain (GMT + 0h). This will be made available on the update page of the Redshift web-site. Having said that one can manually apply any desired time zone but it helps to have the program initialised with your local one. One is not limited to viewing the sky from the Earth’s surface. Indeed, if you want to check out what the sky looks like from, say the Moon, or from the surface of Mars, this is possible with Redshift. 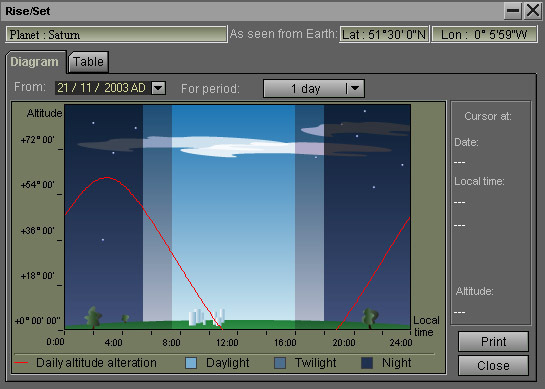 The Rise/Set tool, showing Saturn in this case. A simulated view of Saturn and some of its Moons at 200x magnification as it appeared on the 9th November 2003. A field star is labelled. I wanted to get a current view of Saturn and the position of its brighter moons as it would appear through a telescope. This proved to be more difficult than I had anticipated and it took me a while to discover the correct procedure to use. After setting the sky for the current date and time I used the Find tool to select Saturn. Choosing the action ‘Center on Saturn’ placed the planet in the centre of the sky view. I then set the Zoom to 200x to simulate the view in a telescope. Using the Filters tool then allowed me to select what moons I wished to display and label. I also used the Filters tool to choose a limiting magnitude of 11 for the field stars and to label them using the Tycho-2 designation. A simulation like this would not be complete without the ability to animate the motions of the sky and planetary bodies, and one will not be left dissapointed. Detailed maps of the Moon and planets are also provided, as is a comprehensive encyclopaedic astronomical dictionary, with pictures and even web links. This encycopeadia is linked to a photo gallery, to which the user can add images of their own or downloaded from the web. There is even a list of astronomical record breakers. A section of the Moon map. 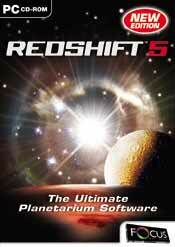 Redshift 5 should appeal to all astronomy enthusiasts be they beginners or advanced. Despite my minor quibbles I would definitely recommend it. The product retails at £29.99. More information can be found at the Redshift website. I would like to give a special thanks to Dr Sergey M. Kudryavtsev at Maris Technologies for his assistance with my technical questions regarding the software. Also see Malcolm Neal's later review of Redshift 5.1 Deluxe.